Experience American history and the evolution of the guitar from the 1920&apos;s through the 1970&apos;s through Songbirds Guitars extensive anthology of permanent and revolving exhibits on the campus of the world-famous Chattanooga Choo Choo. Songbirds takes you through the origins of rock and roll from gospel to blues to R&B to the sounds of Motown and the invasion of the British. See and hear the impact of surf music and the rural acoustic music of country, bluegrass and folk. 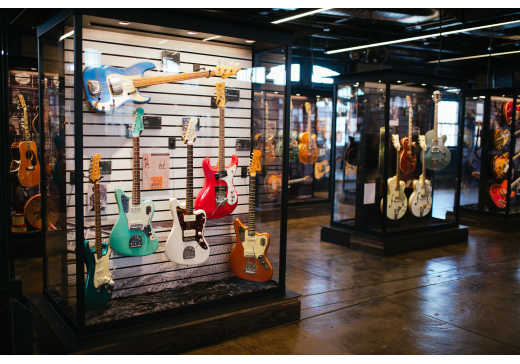 Each exhibit features the guitars that made the music as well as the stories and artists that brought them to life. Songbirds is historically accurate, educational and fun for both guitar enthusiasts and those new to the world of fretted instruments. Take a look at the collection here. The museum hosts musical performances and also serves as an event space to host private parties. Take a look at the upcoming shows and events. -34 Gibson Les Paul Model Sunbursts from 1958-1960. Some of the most expensive of their kind. Considered by many to be the Holy Grail of electric guitars. -Over 300 custom color Fender guitars - a rainbow of color. Many of these are one-of-a-kind. -Over 75 custom color Gibson Firebird guitars - even more scarce than the Fender custom colors. -Over 45 classic "Bluegrass" flattops, flathead original five string banjos, mandolins, and the like representing the best of Martin, Gibson and other manufacturers. -Dozens of other Gibson custom color guitars including many ES model thinline guitars and archtop guitars. -An outstanding collection of both solid body and hollow body Gretsch guitars.